Lively sadly says good bye to Zheng Cao, a lovely lady, kind and warm human being, a beautiful mezzo soprano. Zheng and Leslie met when Leslie wrote a feature article for Asian Week about the many gifted Asian Americans at the San Francisco Opera. They met again when Leslie’s feature, New Faces of Opera, was the cover story on the first issue of The Hedgehog, the international arts review, in December, 1996. 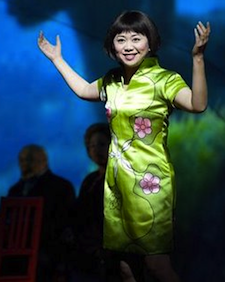 Zheng was known for her effervescent performances of Mozart, her touching portrayal of Suzuki in Madama Butterfly, and in 2008 she sang the lead role in The Bonesetter’s Daughter, SFOpera’s premiere of Stewart Wallace’s opera of Amy Tan’s book. Zheng Cao’s generous spirit was well represented when, even though very ill, she appeared in Feb., 2012, to announce the creation of the Merola Opera Program Zheng Cao Fund which will go to support either mezzo sopranos or Asian Americans. Take a bow, Zheng Cao! You made the world a better place with your music and your presence. This entry was posted in Uncategorized on February 27, 2013 by Leslie. Hello, Kathi, Thank you so much for your kind comment. It was a surprise. I truly appreciate it.